One of our goals for Not Dogs is to get our delicious fare to as many people as possible. When we opened our first fast-casual restaurant in Birmingham we knew we wanted to offer a delivery service so that customers could enjoy Not Dogs at home as well as in the Bullring. 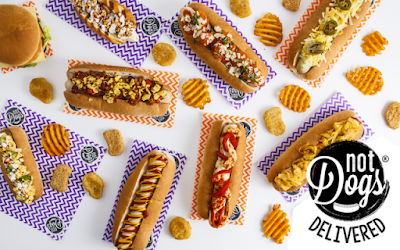 A year on and Not Dogs are available on both Deliveroo and UberEATS! We still get over-excited seeing the iPad ping to tell us someone’s ordered a Not Dogs feast and always write a special message with each order. Whenever we post about ‘Not Dogs Delivered’ on social media we get lots of replies asking when we’ll be available all over the country and believe us, we promise, we’re working hard at getting Not Dogs to even more of you. In the meantime, our Birmingham customers can check us out on Deliveroo and UberEATS. Unfortunately I'm still about 63 miles outside of your delivery radius, or else I'd totally be ordering Not Dogs right now.